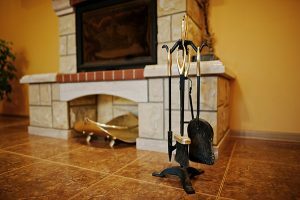 Did you know that even if you don’t use your fireplace you still need to have your chimney swept? Hiring a professional company to come in and do an inspection and cleaning of your chimney is essential to maintaining a healthy home. This is a chore you should take seriously and it should be done a few times per year, otherwise, you could be putting you and your family at risk. 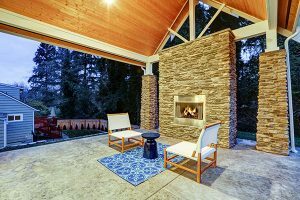 There’s one resource you should turn to when it comes to chimney safety and all things chimney related—it’s the Chimney Safety Institute of America (CSIA). The National Fire Protection Association (NFPA) also helpfully contributes to standards and advice on chimney, but as far as the amount of sweepings per year is concerned, the CSIA tends to disagree with the NFPA. According to CSIA, open masonry fireplaces should be swept when there is a presence of 1/8” of soot build up and sooner if there’s glaze present in the chimney system. Of course, this can mean more sweepings than just once a year, but it also means keeping your chimney safely functioning. The CSIA argues that just an 1/8” of build up can mean that there’s enough fuel to cause a chimney fire, which is extremely dangerous and damaging. Chimney fires can even spread to the main home. 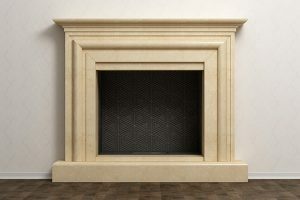 The NFPA is ambiguous in comparison to the CSIA, stating in their Standard 211, “Chimneys, fireplaces, and vents shall be inspected at least once a year for soundness, freedom from deposits, and correct clearances. Cleaning, maintenance, and repairs shall be done if necessary.” As you can see, the CSIA has clearly done their research in concern with the amount of chimney sweeping necessary to keep the system without hazards. When looking for someone to clean your chimney, you should make sure that the service personnel and the company he or she works for carries certain credentials. One credential you’ll certainly want to have in your chimney-sweeping professionals for them to be certified by the CSIA themselves. Does the company carry a valid business liability insurance policy to protect your home and assets against any accidents? You can use the locator on the CSIA Certified Professional Locator on the CSIA website to find a company with the right certifications near you. Finding a trusted company to come in and do such a job is not a task to be taken lightly. Another helpful way to search for the right company to clean your chimney is to ask your friends and family, or better yet, go online and read the reviews. 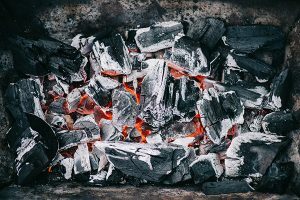 After selecting a company and making an appointment for a chimney sweep, you can expect to receive a call confirming your appointment in advance. You might have been given a general time for the chimney sweep to show up at some point during the day. If you didn’t receive a phone call confirmation, it won’t hurt to give the company a call to make sure a chimney sweep is planning on servicing your home as scheduled. Your appointed chimney sweep will survey and prep the area for a proper cleaning and sweeping. You can expect them to lay a drop cloth or plastic down where they will be cleaning to protect your home and furnishings. The chimney sweeps will also have a shop-vac ready to sweep up any mess. Chimney sweeps use a heavy metal bristled brush to clean your chimney. These tools are long rods, with the bristles located at the very tip. Professional chimney sweeps will also be outfitted in gloves, goggles, and masks to protect themselves from the soot and ash. 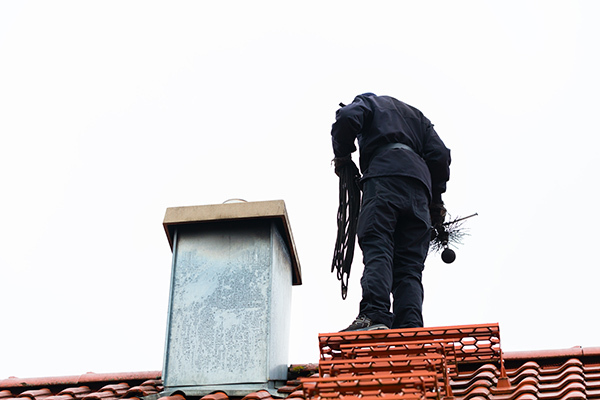 The chimney sweeps will begin from the flue and work their way up, begin at the roof’s chimney access and work their way down, or in some cases, do both. Either way, the ultimate goal for them is to scrape the coating that has accumulated and built up on the chimney lining from numerous fires. The coating and debris will fall to the fireplace, be swept up and vacuumed away. Debris like creosote can form from having fires in a wood-burning fireplace. Creosote is toxic and can clog a chimney, making a chimney-sweeping all the more essential. Animals can also build homes in chimneys. Chimneys are the perfect spot for animals, or at least they think it is—quiet, dark and protected from the elements. When a fire is lit, however, this can be deadly for animals trapped inside. Chimney sweeps can remove animals and nests safely, encouraging them to find much better places to set up camp, for everyone. By the time the job is done, it should look as if no one was there at all. Professional sweeps know how to clean up their mess and will have brought all of the necessary tools to do so. When you’re presented with the bill, there’s also a good chance you’ll receive the report from the chimney sweep, too. The chimney report will allow you to know the condition of your fireplace chimney and/or exhaust system. Some professionals even use a special camera to analyze the interior of the chimney for this process. Take any advice your chimney sweep has seriously, as they have thoroughly analyzed your chimney and know if there are any potential steps that need to be taken to prevent future hazards. At this point during your chimney sweep cleaning, you will also want to schedule a future appointment, as companies tend to book their schedules well in advanced and you won’t want the health of your chimney and home to be neglected. 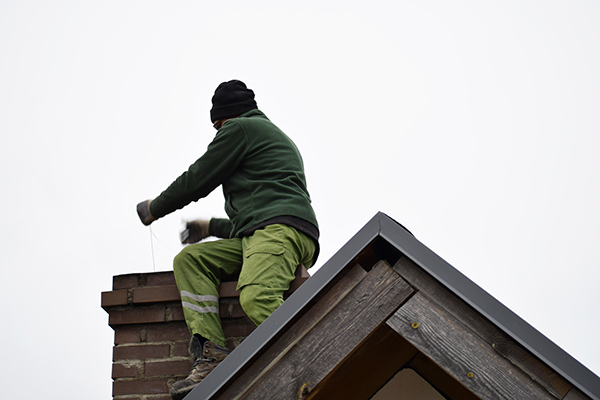 Although the CSIA advises to have a chimney cleaned when there’s 1/8” of debris on the chimney walls, this can be difficult for an average homeowner to gauge. It’s a safe bet to make your next appointment six months to a year in advance, depending on the season. There are a few things you can do to prep for the arrival of your chimney sweep. Move any furniture you’re worried about back a few feet away from the chimney and cover it with plastic or a drop cloth. Do the same with any other rugs or tapestries that might be exposed in the room with the chimney. While it might go without saying, don’t light a fire before your appointment. Your chimney sweep needs to work with a chimney that’s been cooled for at least 24 hours. Also make sure that you’re at home the day of the appointment, even if the company has given you a general time for the chimney sweeps to arrive. You’ll want to let them in and show them inside so they can do their job efficiently and effectively. Finding a trusted, well-reviewed, and certified company to sweep your chimney is half the battle. The rest of it is up to you in ensuring that you are scheduling appointments at least twice a year to have your chimneys swept. Look no further than Early Times for your next chimney sweep. We’ve been in business since 1985 making chimneys safe and customers happy. Early Times will be in and out during your chimney sweep appointment, we can have your chimney swept in under an hour. Every sweeping we do is backed by a no-mess guarantee and accompanied by a level I inspection to identify any possible hazards. Get your free quote now!